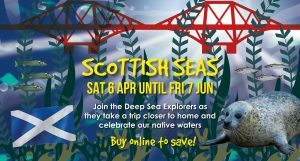 Fancy peeking beneath the Scottish seas and discovering the incredible variety of unique creatures that swim, slither and scuttle around our beautiful rocky shores? If you don your kilt for our big Explore the Scottish Seas launch event on the 6th April, you’ll get FREE entry on the day. With Dunfermline Pipe band serenading events, and Charlie the Clownfish eager to greet you and your family as you explore the many exhibits under our roof, expect plenty of fin – or should we say fun – above, and below, the water. We’ll be exploring the Scottish seas during the next three months, so with Easter on the horizon it’s a great time to bring your own shoal of nippers along to meet, and even get hands on, with our very own little nippers. And after they’ve met our crabs, your little stars can discover the unusual world of our starfish, seahorses and many other marine wonders. Though some of our undersea creatures may be local, you’ll still need to keep your passport handy… your special Deep Sea World passport that is. Can your little explorers complete each task and get every section stamped? Will they unlock the mysteries of the local rock pools with our presenters? Will they visit the reef to learn about the importance of caring for our local sea life, and learn how they can help keep the marine environment healthy and plastic free? And for the final passport stamp challenge, are they brave enough to handle one of our slippery sea creatures? There’s also plenty of chance to look beyond our local shorelines and get nose to tail with our stingrays, catch the piranhas munching on their feed, and see a seal trick or two, amongst many other exotic and fascinating displays, events and talks. Now dust off that kilt and get ready to make some new undersea friends! Sea you there! SAVE up to 20% by booking your tickets online.